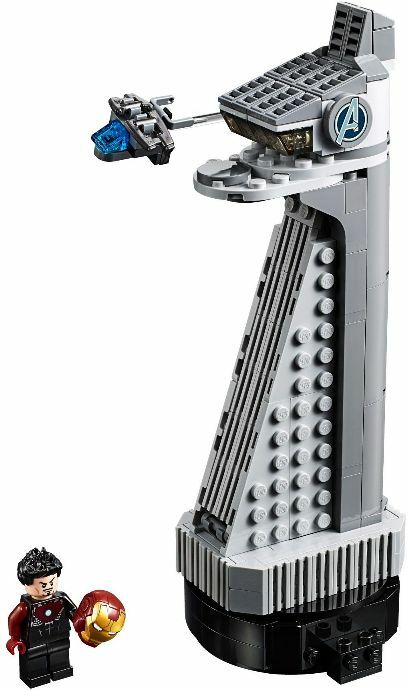 According to stonewars.de a new Marvel Super Heroes set, 40334 Avengers Tower, has been found in a Spanish LEGO store and is said to be a gift with purchase from 22-30 April. The microscale set includes a Tony Stark minifigure transforming into Iron Man and a mini QuinJet. News via TheBrickFan and igna_sj_2003 on Instagram. OMG. The best ever GWP? Looks like a shark PEZ dispenser. Looks like a polybag version i hope there's a much larger version of this being released or the Avengers compound but bigger than the endgame set lego have created..
Other than the fig and the Avengers Logo tile, pretty well just standard parts. Would be easy to recreate. I'm much more pleased with the Mustang Keychain. @legoavenger14: This may be microscale but it's way bigger than a polybag set. A better comparison might be the Diagon Alley gift with purchase set from last year. I really like this one; especially the Tony Stark/Iron Man is awesome! It doesn't look like he has printed legs which is a shame. I like it a lot. What a fun and creative concept. Hopefully it won't be to expensive second hand because I just placed a large order to get the (still far superior) MCU collectible figures pack. Not sure my bank account can take another hit like that within a month:( Still a great value for a GWP set! I spent some time looking up which Mk. this suit is gonna be, and I couldn't find a model that has red body and black legs. Then I looked closer at the minifigure, the black part is actually Iron Man's clothing under his suit LOL Also look at his left hand you can see that he has black arm with flesh hand. So it's an incomplete suit. Interesting. @ericchuimk and @Gruffy1987- It's not from Infinity War. He was wearing a gray tracksuit under his armor (the figure from the Bricktober pack) and this suit has a circular arc reactor while the MK 50 worn in Infinity War had a triangular reactor. This suit is speculated to be another MK 43, since in Age of Ultron he was wearing pieces of the suit during Vision's birth scene while fighting Cap, Scarlet Witch, and Quicksilver, and that scene took place in the tower. Many of you swallow everything from TLG as ”I really need it/the best EVER” etc. If there’s anything good about it, it must be that it’s free. But that’s it. @ericchuimk I believe is his partial suit-up that occurs in AoU when they're deciding whether activate Vision or not. Cap and Tony have a very, very briefly fight until Thor shows up and activates Vision. I really like this GWP (gift with purchase) but I will hold on for May 4 so as to nab a few sets that I want. More interesting than most of the endgame line. @Chilis_no: Really? To me it looks to be on par with your typical Lego Architecture set—and I've seen plenty of requests over the years for Architecture-style models for licensed themes like Marvel Super Heroes. As for me, I don't really want OR need this since I don't collect Super Heroes sets in the first place. But here's a tip—if a bunch of people like something and you don't, maybe their tastes are just different than yours. That doesn't that they're wrong to like it. Letting people enjoy the things that interest them even if you don't share that interest is a good first step to having a less negative attitude. So is the date for world wide or just Spain? Dang is that nice though! Marvel is getting some good promotions, guess they need them to sell the below average sets. This is utterly fantastic. A nice little microbuild AND an amazing minifig? Take my money. I couldn't recognize it, looks pretty meh. Minifigure is really cool though. I'm not sure, but do I see a new part? It does look like a half 4x4 round plate (like a 3x4 plate with 2 rounded corners) in medium stone grey on the top section. Could also be an existing part that I don't know of yet. @Chilis_no, perhaps other people like it because it’s good and interesting? There’s lots of appeal with this set, and the fact that you don’t see that just means it’s not for you. And that’s fine. Not every set will appeal to everyone. But don’t insult other people. You just come across as ignorant. It looks like a pterodactyl! Don’t like marvel but doesn’t seem like it’s relegated to that theme and could easily be Moded into almost any headquarters. It begs to incorporate it into 21028 New York City! Not my sort of thing but a pretty nice promo - more like this would not be bad at all. Whoa, Architecture line looking really nice this year. It did appear in one 2013 set (along with the only Pepper Potts figure we have gotten) but the set and figs are too expensive on the secondary market. Awesome! It shall be mine. what Iron Man MK is Tony Stark transforming in to???? Do you see the diplodocus head and neck? ?????? Looks like they've used Starlord's blasters for the quinjet wings. Interesting. I don't think so. What I see there could be made with 4x 18980 to get the two Tic-Tac shapes in light-bley. The Iron Man Figs is Stark partially transformed while wearing the Bruce Lee DJ T-shirt, in Age of Ultron. Sick!! Bruce Lee and Stark and Iron Man, 3-in-1 fig. Are you really allowed to count Tony Stark and Iron Man as two separate things? There's a minifig of Clark Kent with his shirt pulled open to reveal the Superman costume. Would you count that as both Clark Kent and Superman? That's the coolest chrome duck I've ever seen! Where can I get one?